The Non-Aligned and Other Developing Countries, NAM S&T Centre invites applications from the scientists of the developing countries for the award of Fellowships under its ‘Research Training Fellowship for Developing Country Scientists (RTF-DCS)’ scheme for the year 2013-14. (iii) Broad Disciplines in which Fellowship are available: Agricultural Sciences; Biological and Medical Sciences; Chemical Sciences; Physical Sciences and Mathematics; Earth Sciences; Engineering Sciences; Materials, Minerals and Metallurgy; and Multi-disciplinary & Other Areas. (iv) Eligibility Conditions: Scientists/ researchers from any developing country (except India) below 40 years of age, possessing at least a Master’s Degree in any Natural Science subject or equivalent degree in Engineering or Medicine and allied disciplines. (v) Financial Terms: Full financial assistance to the Fellows. Detailed guidelines of the Fellowship scheme are given in the attached Announcement Brochure. The last date for submission of completed application form along with required enclosures is Monday, 14thOctober 2013. It is not unusual for farmers to give up on agriculture when repeatedly having to deal with erratic and extreme weather events. For Horil Singh, a farmer from Rajapakar in India, changes in the summer temperatures and delayed rainfall severely affected his crop planning. The question is, how can a farmer plan for the unexpected? And where does he turn when the rains have failed him yet again? 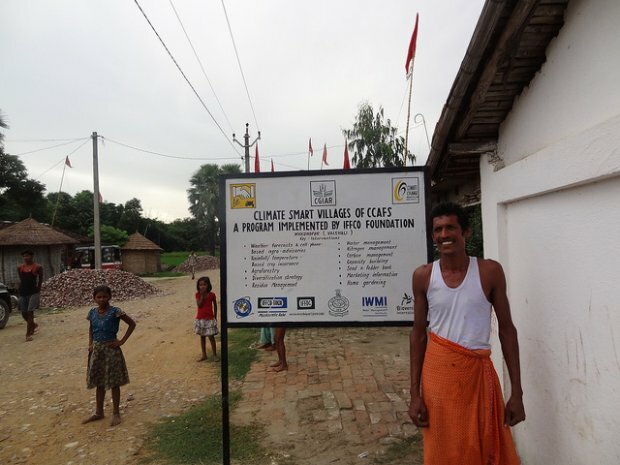 At the moment, our South Asia Regional Program is working hard to implement and scale-up something called the ‘Climate-Smart Village’ model project. The project has reached the furthest in the area of Bihar in India, where a number of videos have been shot, showcasing the activities. The CGIAR Research Program on Climate Change, Agriculture and Food Security (CCAFS) envisions these Climate-Smart projects to not only be long-term, but also as participatory as possible. Farmers, especially women, are encouraged to weigh in on the activities and take the lead in prioritizing what activities should be implemented in their villages. This is to make sure the climate-smart farming practices learned are kept alive long after the project has been phased out. The project aims to raise awareness among farmers about how they can continue farming, and increase their crop yields and income, despite climatic changes. Some interventions also have low emissions co-benefits, making sure that the activities have a ‘climate-smart’ edge to them. One successful activity that has been rolled out is the index-based insurance scheme. Several farmers have aleady received payments for failed crops that they have been able to invest in new seeds and tools. The scheme relies on little financial investment but is a good example of collaboration, linking research with practice. On 15 July, we will be convening a side event at the Africa Agriculture Science Week, in Ghana, on the Climate-Smart Village model: Climate-Smart Villages in Africa – Opportunities for farmers and communities. If you are at AASW join us! Six years ago, food prices spiked dramatically worldwide. In some countries sharp price rises of some staples are believed to have galvanized public discontent causing instability and social unrest. Several commentators have linked the events of the Arab Spring to soaring wheat costs, which hit poor families hard. Others saw the crisis as yet another reminder of how our current agricultural production systems are becoming increasingly fragile. And certainly there are few factors that may have played a role: competition for cropland from biofuels, high oil prices, speculation in grain markets, restrictions on grain exports plus extreme weather events. But scientists argue that there is one other underlying element missing from this list: degradation of land and water quality. As a consequence productivity of our agricultural production systems is declining. The Small Earth Nepal (SEN), in collaboration with the Consortium for Capacity Building (CCB) at the University of Colorado at Boulder, USA with support of the Asia-Pacific Network for Global Change Research (APN), and with technical assistance from the Central Department of Environmental Science (CDES), Tribhuvan University and the Agriculture and Forest University (AFU) is organizing a national-level program entitled the “Graduates’ Workshop on Green Economy” in Kathmandu, Nepal on 28 July 2013. The Small Earth Nepal (SEN), in this regard, is pleased to invite you to submit the abstract of your research paper (oral/poster presentation) for the workshop, which aims to provide a platform to early career researchers to present their research findings and expose their work to the scientific community, academicians and colleagues. This workshop will also create an opportunity for graduate students and young researchers to learn, share and put forward their thoughts on the theme of green economy. The workshop will include keynote speeches from experts, paper presentations as well as poster presentations. A panel discussion will also be organized to address the emerging issues of green economy and the scope of young researchers to address those issues. Students, early career researchers and academicians from NEPAL, especially those who have already been active in green economy sectors, are eligible to apply. Sustainable agriculture, renewable energy, eco-tourism, forestry and biodiversity conservation, the techniques of climate adaptation etc. Please find the application form on following link and submit it by 19 July 2013. Selected presenters/participants will be communicated via email by 22 July 2013. A travel allowance will be provided to those selected applicants.